Your Critic is in Another Castle: The evolution of the RPG... and me. A year or two ago, I (rather infamously) drew my line in the sand: I do not like party-based games, I declared, and never had. Following this assertion (brought on at that moment by disliking Dragon Age: Origins), I've played both Mass Effect games, am currently in the midst of Chrono Cross, and just devoured the entirety of Dragon Age 2 in a few days. And yet in many ways I stand by my original statement -- so what's changed? 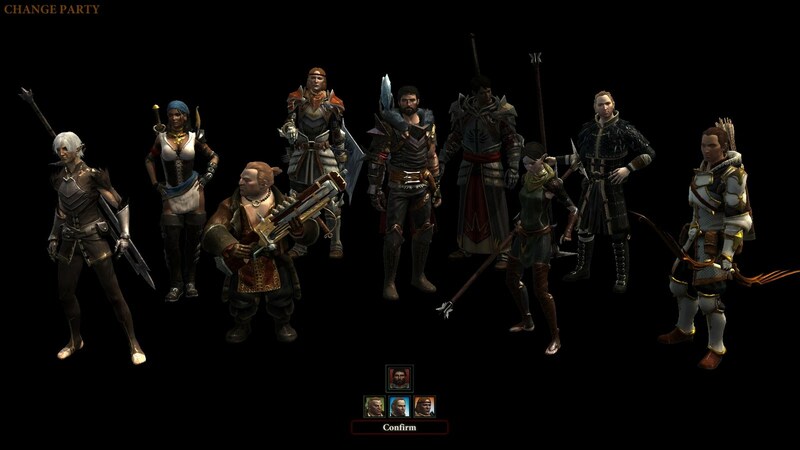 I'll be honest, lady rogue Hawke pretty much always took Fenris, Varric, and Merrill, by the middle of Act II. I'll admit that in part, I've changed. Though I've been loving games and digital worlds since I was a kid, my consumption of various game types has really ramped up in the last three years and I've been exposed to, and learned patience for, some kinds of game design that I hadn't gained wide experience with before. Game appreciation, like film appreciation, is tied to a sense of time and place, and an understanding of the history of the art. My sense of history is still developing. Crucially, though, the games themselves have also been evolving. The difference in feel between Dragon Age: Origins, which hearkens back to an older era of games, and Dragon Age 2, which feels very modern, really crystallizes that evolution for me. Thanks in large part (though not solely) to BioWare's recent design choices, I've been able to narrow down a bit what it is I actually hate about party based gaming. For some people, this is fun. I will never truly understand those people. For me, the joy of playing has never been in the numbers, the tactics, or the methodical min/max situation. I am fundamentally a lazy gamer: I don't want to control a hundred things at once. I'm willing to be responsible for one character and for her tactics, skills, attributes, gear, inventory, and personality. I tend to gravitate toward one character type and I tend to play that type the same way across games. * I like passive skills and quick kills, and I prefer not having to overthink every single character placement or tactical choice. 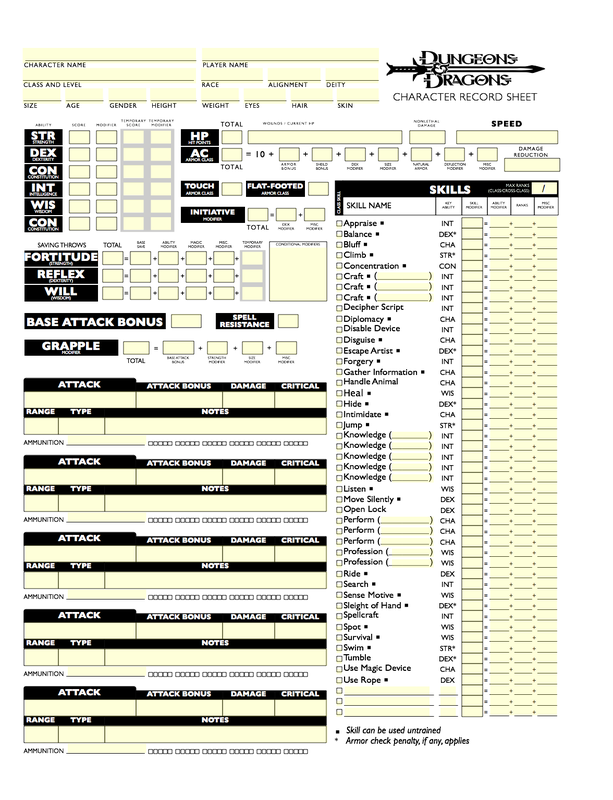 If I'm playing a game where character development is the focus -- in broad strokes, the RPG genre -- then what I want is to take control of my avatar and to understand and master her personality and talents. I don't want to be responsible for controlling others. It's a selfish impulse ("don't be dead weight I have to drag around") but also a self-protective one ("I just can't manage both of us correctly at once; you'll get short shrift"). My aversion to having to worry what others are up to has led to some downright comical contortions. During my EverQuest II years, I was three solid months into the game and level 28 (back when it was much less solo-friendly) before I ever joined a group. The folks I grouped with were all in the same guild and I joined up with them a few days later. That's how I eventually discovered the pleasure of watching a plan laid and executed with a minimum of communication. Everyone knew their roles: tanks took the hits, healers healed, chanters controlled crowds, and DPS damaged things. Sure, for special bosses or raid zones (or one memorable five-Fury group) we discussed strategy at greater length, but each character always knew her role because each was controlled by an autonomous being somewhere, an individual man or woman at a keyboard just like me. Some of those raid strategies worked better than others. Running a new x2 zone on Test, June '05. When handed Divinity II and Dragon Age: Origins in the same week, I gravitated to the former because I could simply strike out into the world as I pleased, without worrying about what others wanted, needed, or thought of me. I've been bored, in the past, with having to make the rounds among companions and crew to check in on each and every one of them and their personal needs. I've been thinking about the "why" a great deal over the past week. I think it's because for a long time, in many of the games I played, companion characters' personal needs either felt mechanical, pointless, or kind of unhinged. That's a personal assertion, and not necessarily a quality-of-games one; it has to do with my own particular wiring. As much as I hate to admit it, because I'm a book-lover through and through and an imaginative one at that, I think what's actually hooking me into this new RPG era is the voice-over work. When I play a game like Chrono Trigger or Chrono Cross, everyone sort of sounds the same. Yes, I imagine characters speaking differently, with different cadences, accents, and mannerisms, but in the end every voice is still, on some level, mine. I can't give other characters inflection that I can't imagine and active as my imagination is, in a text-only world my interpretations might run counter to the scene's intent. 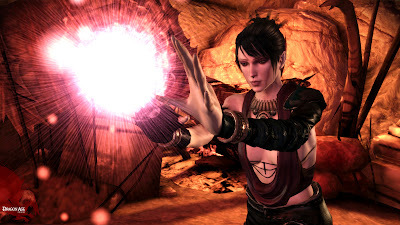 And when Morrigan disapproves, she lights you on fire. It's just her way. Having companions find their voices has upended the way I view these NPCs in my games. It's an emotional connection to the narrative and its world that isn't a new concept, but that makes me personally care a great deal more. Even in a silent protagonist, fundamentally single-player game like Fallout: New Vegas, companion voices make me feel differently and realign my priorities. I want to earn Boone's respect, not his easily-granted disgust. Hearing Arcade move from self-effacing sarcasm to honesty over time makes me feel trustworthy. Disappointing Veronica makes me feel like I've kicked a puppy. And actually getting to hear Christine talk and explain, after she had been rather violently robbed of her voice, is deeply satisfying. The recent BioWare titles (the Dragon Age and Mass Effect franchises) have done a rather extraordinary job of surrounding me with characters I care about. Between advancements in game tech and a strong investment in decent writing, I'm able to immerse myself in the illusion that my [Hawke / Shepard / Warden] is surrounded by other people, as real as my intervention has made the PC, with their own voices, stories, and personalities. And they can control themselves. Should I be so inclined I could order Garrus which baddies to shoot and when, but I never have to. (I choose not to play on difficulty settings where that level of tactics would be required.) I can take control of Isabela or Aveline, or issue direct commands to them, but I don't have to. Without very much intervention (adding health potions to their tactics), Fenris knows how to watch my back and stupid Anders knows how to heal the party as needed. Varric doesn't need me to issue a complex set of numbers and commands in order to seriously own that crossbow. The ability and choice for the player character to have intimate and meaningful one-on-one conversations with non-player-characters has reframed the way I relate to a game. If I need to make a complex or consequential decision in Chrono Cross, I look at a guide, or I talk it over with a friend (i.e. the spouse) who has played the game before and can give me non-spoiler guidance. But when I need to make a complex or consequential decision in a game like Dragon Age 2, I have Hawke talk to her friends. They become her guides and, by extension, mine. Does Aveline disapprove of a choice? She must have a reason and it's worth asking her before I act. I'm used to NPC companions either feeling burdensome or feeling invisible -- for all that I liked, say, Lucca and Frog in Chrono Trigger, taking their turns in combat just meant me moving through one list of all options, and switching party members roughly meant switching combat tactic options and not much else. That both game design and I have reached a stage where player companions feel almost like MMO buddies has been revelatory. For the first time, when given the choice I care more about my companions' quests, evolution, and goodwill than I do about exploring every corner of the world (though I still do) or about the main story (which always comes around again in due time). I haven't always particularly enjoyed characters' quests (bite me, Anders) or supported their loyalty missions (you too, Zaeed). But as this year in gaming starts to wind down, I'm realizing that now, the companion quests are the ones I want to appear more often. I enjoy making it a point to wander around the Normandy, or around Kirkwall, or around the campfire. 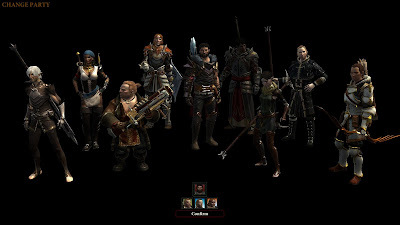 Fenris, Anders, Aveline, Varric, Isabela, Merrill -- their stories, their trust and forgiveness (or betrayal), are what was important to me in Dragon Age 2. And as I look toward 2012 and Mass Effect 3, I know that Shepard can stare down the Reaper threat, but what I really want is to be sure that Garrus, Liara, Wrex, and Tali will trust her and stand by her side while she does. Until then, back to Chrono Cross, where Kid is Australian and Poshul is desperately annoying -- but everyone is as silent as Serge. *For the record, that type is rogue / thief / assassin, heavy on the stealth and dual-wield or, in a futuristic setting like ME, on sniper tactics. Sneak-and-stab or sneak-and-shoot: if they see me coming I'm doing it wrong. **Because seriously, I want to see if I can find out why [DA:O character who appears at the end of DA2 with Cassandra] shows up then and there, 6-7 years after the events of DA:O. Context: I needs it. And for more discussion on party-based gaming, that happened to come up while I was in the middle of this personal meditation, see Ta-Nehisi Coates and the Horde on The Future of the Computer Role-Playing Game. With regards to your double asterisk: if you get the DLC that gets you Sebastian, you'll get a wee bit more context. That might not be worth the cost to you, especially as Sebastian is mostly redundant with Varric gameplay-wise. Massive props to you for playing Chrono Cross in this day and age. It's a game that I think of a lot because I love Yasunori Mitsuda's music, but I've barely touched it since 2001. Squaresoft games from the original Playstation era felt revolutionary to me at the time, but they're neigh unplayable to me now. They've aged far more poorly than games from immediately before or immediately after. Yeah, I'm playing DA:O now with all its DLC in place and after that, I'll import my save to DA2, get the Exiled Prince DLC, and run through DA2 again (probably making nearly all of the same decisions, but with a sense of context and to make my own personal "canon" version of the story, as it were). As for Chrono Cross, I'm using the original discs but actually running it on a PC emulator. Looking at it in a small window with some roundabout cleanup of the edges and such makes it a lot easier for me (physically) than trying to look at a ten-year-old game on the living room TV. FYI, there are a lot of plot-flag import problems with DA:O, and I think that includes some of the DLC. I know Awakenings doesn't import at all. I'm not sure if these have been (or can be) fixed, so I recommend that you look into that before you devote X hours for something that won't work. I think the RPG label hasn't really meant as much as we have thought it should since the NES age and the rise of the JRPG. Specifically Legend of Zelda. That it, Diablo, Deus Ex, Wizardry 4, and The World Ends With You are all considered part of the same genre is insane. I've heard a lot of grand unified field theories about what makes a "roleplaying game" or what exactly "rpg elements" are, but I haven't heard any explanations that actually work across the board. Lots of people consider anything setting with magic an RPG, regardless of mechanics, which is a ridiculous explanation even if you didn't have Mass Effect and Deus Exto point to. If you surgically implanted Skyrim's art assets and story into Modern Warfare 3, it would not suddenly become an RPG. I'm probably tilting at windmills here, but I think the real evolution at work is the ballooning of the definition to mean whatever the speaker wants it to mean. That is one of the other issues. The best I can come up with for the current meaning of "RPG" is "a game that focuses on player character development," and I mean that in a really numerical way (skills, levels, inventory, items, attributes) rather than "character development," the narrative process in which a character has some kind of personal growth over the course of a story. This, under our sort of modern mess, differentiates the RPG from the action, adventure, or action/adventure game, in which the character doesn't tend to have player-assignable attributes (other than weapon choice). Granted, that still leaves a lot of murky room and incorrect overlap (you can level up skills in God of War but it's sure as hell not an RPG in any useful sense) but it seems to be about the best I can do for the moment. The concept that "high fantasy setting" = "RPG" drives me up an everloving wall, by the way. Setting and style are not the same thing. I dunno if the "party based" CRPG isn't a generational thing - a throwback to pen and paper RPGs. Seriously, who had any fun playing table-top RPGs with just ONE player and a GM? I'd imagine most of the older CRPG designers were table-toppers originally, whereas the newer generation of designers aren't. Thus the guys (and gals) behind Wizardry and the Might and Magic games just figured most of thier buyers and players would want to emulate the multi-party games they played, even if it meant that that one player had to play all 3/4/5/6 parts. Back before Diablo came out, I couldn't imagine that an "RPG" would NOT involve more than 4 "player characters," because that's just what a "role-playing game" was to me. The very first "one-player" CRPG I ever bought was Daggerfall, and even then I didn't like it nearly as much as Wiz6 or Wiz7 or the Jeff Vogel "Exile" games because, DAMNIT!!! !, "real role-playing games" meant a team of characters co-operating to defeat the world. Even if that "team" was/were just me. It wasn't until Morrowind that I had second thoughts about that. Maybe this "me against the world" thing wasn't so bad. At the very least, I didn't have to try my best to keep all "my other selves" alive. 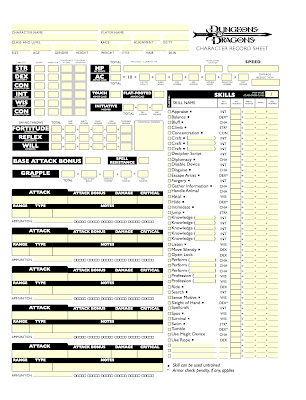 The ironic thought I have is that the 4e character sheet you show is pretty streamlined compared to some. MrsJay is in to melee DPS, too. I've known quite a few women who's arc moves from healer to DPS, though often it's ranged. I never could play healers. I mean, I did -- at the urging of my guild and our raid alliance (and with their assistance) I power-leveled my Fury so that I could switch toons if we were DPS-heavy and heal-light, and I was a pretty competent group and raid healer if I do say so myself. But I was still always fighting the urge to sneak into the fray and backstab something.